Editor’s Note: The following article is an excerpt from Take Control of Running Windows on a Mac, a $10 electronic book available for download from TidBits Electronic Publishing. The 104-page ebook contains step-by-step instructions for installing Windows in Boot Camp, Parallels Desktop, and Q; details on making mice and keywords work properly in Windows, sharing files between the Mac and Windows, and avoiding Windows malware; and a $10-off coupon for Parallels Desktop. Broadly speaking, you can use either of two approaches to run Windows on an Intel Mac: dual-boot (using Apple’s Boot Camp software) or virtualization (using third-party software such as Parallels Desktop or Q). In this excerpt from Take Control of Running Windows on a Mac , I describe these two approaches and help you choose which path to take; I also describe the two major virtualization options in some detail. 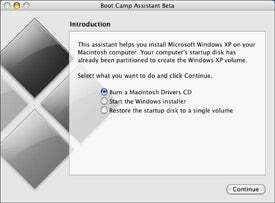 Apple’s Boot Camp software (currently in public beta testing) enables you to divide the hard disk of an Intel Mac into a Mac OS X partition and a Windows partition, install Windows XP onto the Windows partition, and choose either partition as your computer’s startup volume. Then, after choosing the Windows partition, you can run Windows XP on the Mac just as if you were running it on a PC. The Boot Camp Assistant window asks if you want to start the Windows Installer on your Mac; you can also use this screen to restore your startup disk to a single partition if you’re tired of living with Windows. The main thing to keep in mind about Boot Camp is that when you use it, you have to make a choice: at any given time, your Mac is running either Mac OS X or Windows, but not both. Depending on which options you choose, you may or may not be able to see your Mac’s files when running under Windows (and vice versa). But while running Windows you won’t be able to use any of your Mac software, and while running Mac OS X you won’t be able to use any Windows software. With Boot Camp, Windows has access to all the RAM installed in your computer—more than it would if Mac OS X were also running. The performance of Windows, and particularly of graphics, is somewhat higher; the difference is especially noticeable in games. Boot Camp was designed and tested by Apple for use on its computers, and is likely to be well supported in future versions of Mac OS X. Some peripherals won’t work, including iSight cameras, Apple Remotes, Bluetooth keyboards and mice, and Apple USB Modems. Even if you plug in headphones or external speakers, all sound will come through your Mac’s built-in speaker(s). Using an Apple keyboard, you may not be able to enter certain characters, such as the euro (€) symbol, or perform a Print Screen command, without special procedures. In addition, the process for installing Boot Camp can be somewhat cumbersome, and more so if you have a Windows CD without SP2. If you’ve been a Mac user for any period of time, you’ve probably heard of a product called Virtual PC (once published by Connectix, and now owned by Microsoft ). With this software installed on your Mac, you can install Windows (or another operating system) and run it inside a window on your (PowerPC-based) Mac. Any program that provides a way for one operating system to work within another can be called virtualization software . When virtualization software is running, the environment it creates for another operating system is called a virtual machine , and an operating system that runs inside that virtual machine is called a guest operating system (to distinguish it from the main OS the computer is running, called the host operating system). But Virtual PC is also an emulator—that is, software that simulates specific hardware so that a CPU can run a different OS than the one it was designed for. Because the Mac’s CPU has to do its own work while also mimicking a completely different type of processor, Windows running within Virtual PC on a PowerPC Mac is invariably quite slow. Intel Macs have the same type of CPU as PCs, so processor emulation is no longer necessary. 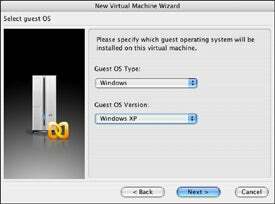 However, to run Windows within Mac OS X, you still need a virtual machine. One reason is that apart from the CPU, there are still other hardware differences between Macs and PCs and thus other hardware components that must be emulated. Another reason is that Windows expects to have direct access to your hardware, but the host OS (Mac OS X in this case) controls the hardware. A virtual machine tricks the guest OS into believing it has direct access to the machine’s CPU and other hardware, and it emulates any physical devices (such as sound cards) that might be different between platforms. When Apple announced the transition to Intel chips, conventional wisdom held that Microsoft would quickly adapt Virtual PC to provide virtual machines for Windows on Intel Macs. After all, it should be easier than what they had to do before, since the emulation problem is gone. However, for reasons known only to Microsoft, no version of Virtual PC for Intel Macs exists yet. (Microsoft does still sell Virtual PC for PowerPC Macs.) Luckily, other developers have taken on the challenge, and you can now choose from two virtualization tools that enable you to run Windows within Mac OS X on an Intel Mac: Parallels Desktop and Q. Both tools share several basic features: you can install and run multiple operating systems (even at the same time); you can run a guest OS in its own window or in full-screen mode; you can share files between the host OS and the guest OS; much of the hardware attached to the computer is available to the guest OS; you can pause (or “suspend”) a guest OS, saving its state so that you can quit the virtualization application but then retrieve it quickly with everything just as you left it (somewhat like putting a Mac to sleep and waking it up); and you can move the disk image containing your entire Windows environment to another Intel Mac if necessary and run it there without modification. Beyond these superficial similarities, though, the two programs differ in several important respects. This setup screen for Parallels Desktop asks you to choose the OS type and version for the virtual machine you’ll be running on your Mac. Parallels Desktop is a commercial application that costs a mere $50. (You can save $10 by using a coupon included at the end of the ebook version of Take Control of Running Windows on a Mac .) After installing it, you can set up a virtual machine for Windows (or the OS of your choice) in a matter of minutes. You can then install Windows within the virtual machine just as though you were installing it on a PC. Parallels Desktop offers a variety of settings that enable you to tailor its performance and options to your liking. Even though the Mac version of this product is new, Parallels Desktop has a polished feel and is generally robust. Better yet, it’s fast. Running Windows XP within a Parallels Desktop virtual machine is almost as fast as booting directly into Windows XP using Boot Camp, and the performance is certainly zippy enough to make it comfortable to use for most day-to-day tasks. I have yet to encounter any Windows software that would not run acceptably in a Parallels virtual machine. Nevertheless, the software is still incomplete as I write this; it has some bugs, and some features are not yet available. For example, Parallels Desktop does not yet support burning CDs or DVDs; FireWire devices do not work; and some USB devices do not work (or do not work at full speed). In addition, the software does not currently emulate a 3D graphics card, so if you want to run a game or other graphics-intensive application that requires hardware 3-D support, Parallels is out for the time being. But given the rapid development progress I’ve seen, I expect most or all of those difficulties to evaporate soon. Unlike Parallels Desktop, Q is a free, open-source application, based on an emulation program called QEMU. One interesting aspect of Q is that it also works on PowerPC-based Macs (though very slowly). And, of course, the price is right. Basic installation, setup, and usage are nearly as easy with Q as with Parallels Desktop. Like Parallels, Q hasn’t yet reached its final release stage—in fact, it’s further behind in development (currently in the “alpha” stage) and has greater limitations. For example, Q currently offers no way to transfer the contents of a Clipboard between guest and host operating systems, networking options are more limited, and fewer USB devices work correctly. Worse, in my testing, I found that Windows XP under Q runs roughly half as fast as it does under Parallels; I’d call it usable for basic tasks, but barely so. Q’s user interface, documentation, and operation show many rough edges. On the other hand, Q does offer several different choices of video and sound card emulations, and it has two other particularly intriguing features: it can import Virtual PC disk images, potentially saving a great deal of setup time, and it can download and install prebuilt disk images for numerous other open-source operating systems (mostly Linux variants). Having used both Boot Camp and virtualization software, my feeling is that there’s no contest at all: virtualization is the way to go, and between Parallels Desktop and Q, the former is significantly superior in almost every way—well worth the $50 it costs. Bear in mind that I say this as a non-gamer, and as someone who needs to switch rapidly and seamlessly between Mac OS X and Windows. But I found the performance of Windows under Parallels Desktop to be plenty fast for all my needs (and close enough to its performance under Boot Camp that I couldn’t tell the difference, at least for non-graphics-intensive applications, without running benchmarking software). The convenience of being able to switch into Windows in a matter of seconds, easily transfer files between systems in real time, and use all my standard peripherals makes the experience of running Windows as pleasant as possible. Still, you might choose Boot Camp if you run Windows primarily for games (and I don’t mean Solitaire! ), if you intend to use Windows for discrete tasks or projects that require no interaction with Mac OS X or your Mac files, if you need features not yet available in Parallels Desktop (such as CD/DVD burning), if you need to use hardware for which only Windows drivers are available, or if you have some important reason to keep your Windows and Mac environments strictly segregated from each other. One obvious reason to keep them separate is to protect your Mac files from Windows malware. As free software, Q obviously has the edge in pricing over Parallels Desktop. And, since Q is open-source software, it’s somewhat less susceptible to the vicissitudes of the market that can affect commercial applications. I would not be at all surprised to see Q’s performance and feature set improve dramatically in the coming months, in which case it may become the ideal choice. But for now, I find it hard to make a good case for choosing Q over Parallels Desktop. Note : In an ideal world, you could run both Boot Camp and virtualization software using a single Windows installation, switching to whichever environment is best at any given time. Currently, however, this is not possible, and though Parallels claims to be investigating a way to do this in the future, using one copy of Windows in two different environments—even though they’re part of the same physical machine—may violate Microsoft’s End User License Agreement. However, nothing prevents you from installing two separate, individually licensed versions of Windows on a computer: one using Boot Camp and the other using virtualization software.